Reid Ranch is located 13 miles north of Fruitland, Utah. See maps below. Large Area Map Salt Lake City to Fruitland. Small Area Map Fruitland to Reid Ranch. Requirements: 16 years or older. Able to lift 70 pounds or more. Two years trail riding experience in which you took inexperienced riders on rides. Previous knowledge in training horses is preferred. Need to be able to work well under pressure because of time limits, have great verbal communication skills, be able to follow instructions, and have a positive and happy attitude. Description: Wranglers are in charge of general upkeep of barn, corral area, tack, and all fences around the ranch. They oversee the welfare of horses including feeding, medical, and safety. They also maintain guest safety equipment (i.e. helmets and vests). Wranglers give safety orientations to guests before each horse ride and make sure guests have a safe and fantastic time. Requirements: 16 years or older. Able to lift 60 pounds or more. Need to be able to stand for long periods of time, work well under pressure, possess problem solving skills and the ability to multitask. Great verbal communication is expected. Have a positive and happy attitude. Description: The Grounds Crew are in charge of the general upkeep of all facilities (i.e. irrigation system, pools, lodges, and landscape). They also provide retail/concessions in our Trading Post and Souvenir Shop as well as overlook the archery, mini-golf and batting cage areas. The Crew will be required to work with machinery equipment including, but not limited to, chain saws, lawn mowers, trimmers and power tools. They need to be able to recognize and be handy with regular tools found in a tool box. Grounds Crew will need to set up and put down 8-Man tents for guests that purchase our Tent City option of camping. The Crew is also in charge of building and lighting campfires for guests each evening. Grounds Crew will need to be positive and efficient in their work and be able to respond to special guest requests in a timely, friendly and efficient manner. Additional duties may be added if necessary. Requirements: 16 years or older. Able to lift 40 pounds or more. Need to be able to stand for long periods of time, work well under pressure of time limits, possess problem solving skills and the ability to multitask. Great verbal communication is expected. Have a positive and happy attitude. Description: Room Attendants are in charge of the overall look of the ranch. They clean guest rooms, including, but not limited to, making beds, cleaning bathrooms, cleaning windows, dusting and vacuuming. They change and replace bed linens, towels and guest amenities, as needed, and do laundry. They dispose of trash and maintain the main areas in the lodges are clean. They respond to special guest requests in a timely, friendly and efficient manner. Room Attendants ensure the outside areas are well kept including, but not limited to, public and camping bathrooms, pool areas and general landscape of the ranch. They make sure the ranch is litter free. Another aspect of the Room Attendant position is ensuring the safety of guests while at the lakefront activities on the Reid Ranch Lake. They welcome guests and go over safety rules. In between guests coming and going, Room Attendants clean the boats and canoes. On occasion Room Attendants participate in shifts at our Trading Post and Souvenir Shop. Room Attendants need to work well under pressure and be able to learn quickly. They need to be able to multitask and be efficient in their work. Most always Room Attendants work as a team but they need to be able to work independently when asked. Additional duties may be added if necessary. Training in cleaning and laundry will be provided, but previous knowledge of cleaning is preferred. Requirements: 16 years or older. Able to lift 60 pounds or more. Must have a Food Handler’s Permit. Need to be able to stand for long periods of time and work well under pressure of time limits. Previous knowledge of kitchen help in restaurants or small commercial food businesses is preferred. Description: Kitchen Help completes assigned duties given by the Executive Chef to include general cooking preparation and maintaining the dining and kitchen areas in a neat, clean and orderly manner. They need to have great guest relation skills and have a happy and enjoyable attitude each day. Requirements: 16 years or older. Able to lift 60 pounds or more. Be able to stand as well as mountain bike for long periods of time, work well under pressure, possess problem solving skills and the ability to multitask. Great verbal communication is expected as well as a positive and happy attitude. Description: Tour Guides take out groups on trails for beginner, intermediate and advanced trail riders. They ensure all guests wear helmets and then explain the safety guidelines before the tour begins. Will also be expected to maintain and repair mountain bikes. Tour Guides will also help out in the Grounds Crew shifts when mountain biking is slow during the day. I loved working for the Reid Ranch each summer because I was able to work outside surrounded by beautiful mountains. I also was able to meet people from around Utah and the country. While working at Reid Ranch I developed my customer service skills and learned the meaning of hard work. I also learned how to develop effective managerial skills under great pressure. I enjoyed working with the other employees and am still stay in contact with some of them today. Working for Reid Ranch gave me a good foundation for my future employment opportunities. I could not have asked for a better place to start my work experience than Reid Ranch. As most 16 year olds do, I started out in a front line position doing maintenance, concessions, and grounds crew work. Over the course of time as my knowledge, skills, and business experience grew an opportunity to prove myself as a leader came. Managing 16 - 18 employees during the summer, learning to create business plans and execute them, and maintaining high guest service standards could not have been better experience to prepare me for other job opportunities that came my way. Now 10 years later and with management positions at The Walt Disney Company, SeaWorld, and Deer Valley Resort under my belt, the sky is the limit for my career opportunities! Reid Ranch, best choice I ever made for a Summer/High School Job. 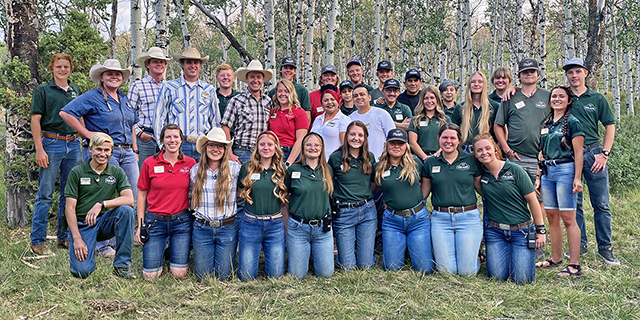 The Reid family are extremely hard working, and they do an amazing job at every aspect of keeping the Ranch an amazing experience for the guests, and employees as well. I learned a lot of new skill sets during the summer at Reid Ranch things such as: Providing phenomenal customer service, cleaning pools, working with horses, building fences, it’s very diverse. There’s always something new on the job every day that keeps it entertaining. The food is outstanding, the chef’s were top notch. The chance to be in nature for three months and experience the Reid’s property and the surrounding beauty of the Uinta Mountains was relaxing and enlightening. There are memories from this previous year that I will never forget, and I hope to return this summer for another season full of adventure and fun! Make sure you’re ready to work, and to work hard. Working for Reid Ranch was such a unique and amazing experience. I was the general manager at Reid Ranch for four years and worked as an activities and maintenance employee for a few years prior to that. Not only did my Reid Ranch work experience help me improve my operational and managerial skills, it also has set me up for truly great jobs for the past 12 years. I applied for an internship with Walt Disney Co. and they were so impressed with my Reid Ranch managerial experience that they accepted me right away. Because I was given the opportunity to manage 15 employees as well as oversee the ranch during the largest group Reid Ranch has ever seen of 500+ guests at one time, I have had nothing but success in getting my MBA and moving upward in my career in the financial industry. I couldn’t have asked for a better way to start my working experience as a young adult and then through college. Thanks Reid Ranch!